The Oxford dictionary defines a knick knack as a “cheap ornament, trinket, trifle, bauble, bric-a-brac, bagatelle, gimcrack, gewgaw, bibelot or kickshaw.” A sample sentence in the dictionary uses the word thus – “Her flat is overflowing with knick knacks.” But what is the significance of these charming (or not so charming) trifles? Do they have the power to influence an artist’s practice? 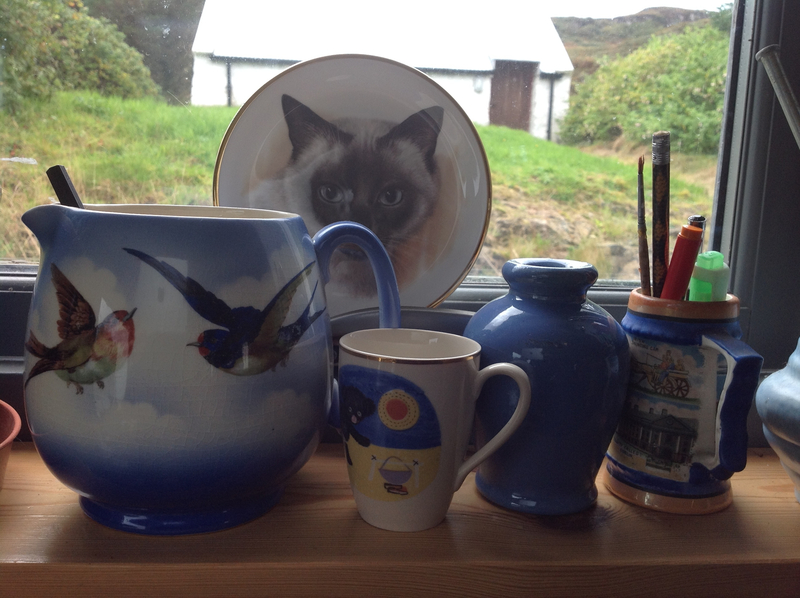 Just one of the cluttered windowsills in Colbost House – overflowing with knick knacks! I have already touched upon the significance of the objects we have about us to demonstrate status, sentiment and superstition. Now I want to examine the apparently eternal appeal of of mass produced pottery. It may be that the permanent nature of a ceramic piece or the pliability of the material that allows it to take almost any shape and colour has an inherent appeal but whatever the reason there is something about pottery that is very compelling. And I am not alone in my addiction. Mark Twain wrote “it is the failing of the true ceramiker, or the true devotee in any department of brick-a-brackery, that once he gets his tongue or his pen started on his darling theme, he cannot well stop until he drops from exhaustion…. 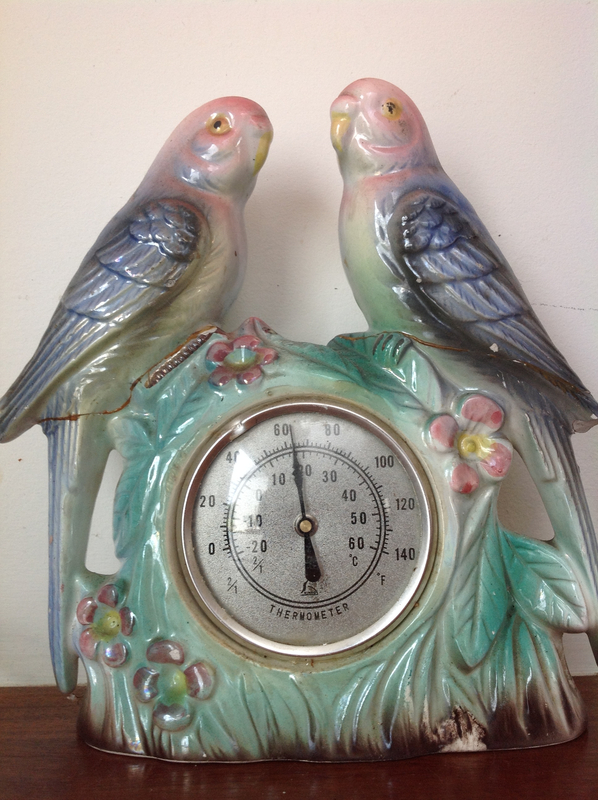 the very “marks” on the bottom of a piece of rare crockery are able to throw me into a gibbering ecstasy’.”* And although I’m more of a maker than a collector I know that I am not immune from the charms of a budgie shaped thermometer (yes, really) or yet another curiously shaped teapot. I bought the budgies in a junk shop in Crouch End in 1976. I believe they originated in the Dutch Jema factory and were probably made in the 50’s. It seems that not a few modern ceramists have been drawn down the slippery slope by looking at their auntie’s collection of china pugs or the neighbours’ Beswick Siamese cats. Incidentally, how I craved these latter as a child but was never allowed one because my mother considered them ‘nouveau riche’. 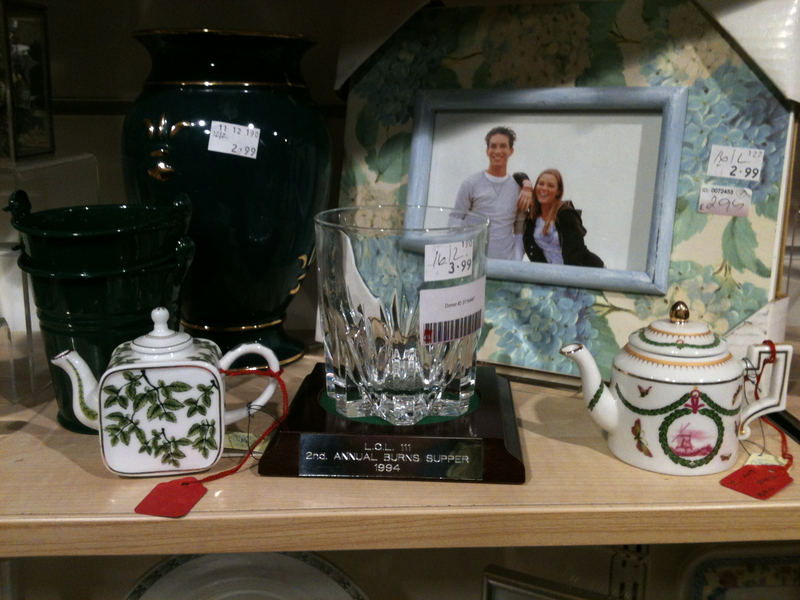 Now I have both the china pieces and the living felines, as well as the unfortunate addiction to ceramics. 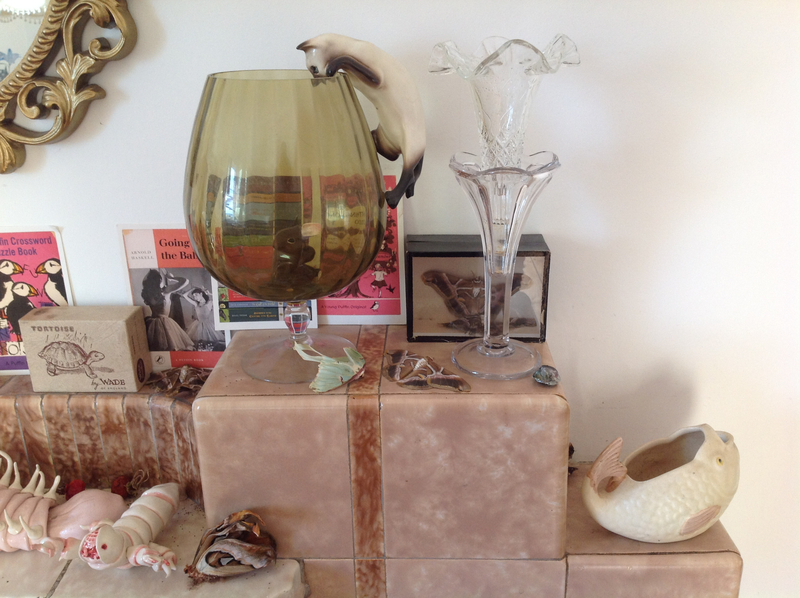 It was a joyful day when I found the Siamese cat hanging from the goblet. I found it (and its cousin) in the now sadly closed antique shop on perth Road. Notice also the fish gravy boat – it’s part of a whole service that came from Brick Lane Sunday market at least forty years ago. The other Siamese goblet – (I don’t like this one so much but it must be displayed adjacent to its cousin). The rubber bambi was left on the railings outside my flat. I haven’t liked to throw it away. The clay mannikin was stranded in the MFASSP studio and I felt it needed a home. A dear friend sent me the Little Plum postcard and because I love both her and the book I have kept it. Rachel Hurdley has argued that “the cultural norm is to display things in the home for moral reasons.” It seems that I am compelled by some moral imperative even though I am not sure what it is. The ceramist Richard Slee remembers “I had two spinster aunties. They lived in a terraced house that was full of pottery….terrific. 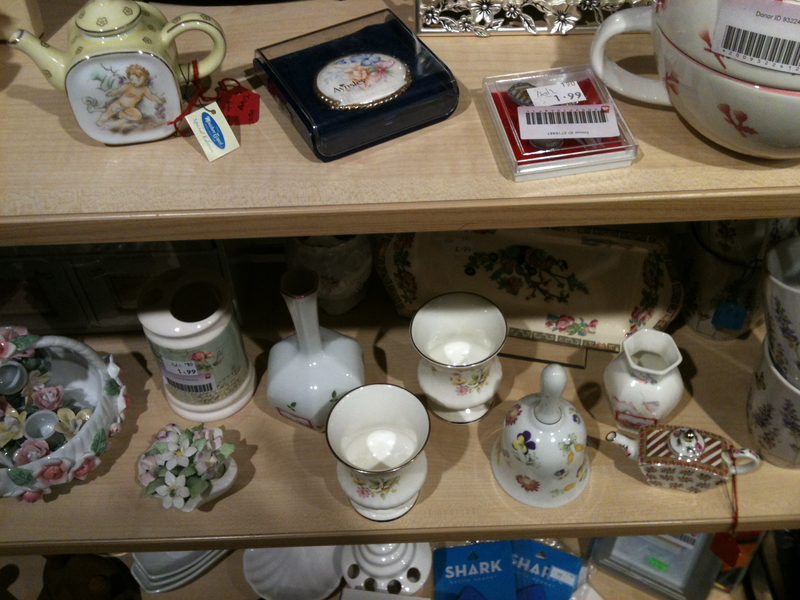 I was fascinated with their knick-knacks…. ;but I’d gone to art school and had been imbued with Modernism, so that one felt almost guilty looking at this stuff.”** I often wonder about this; after all I’ve been to art school too (although I don’t think I have been imbued by Modernism). 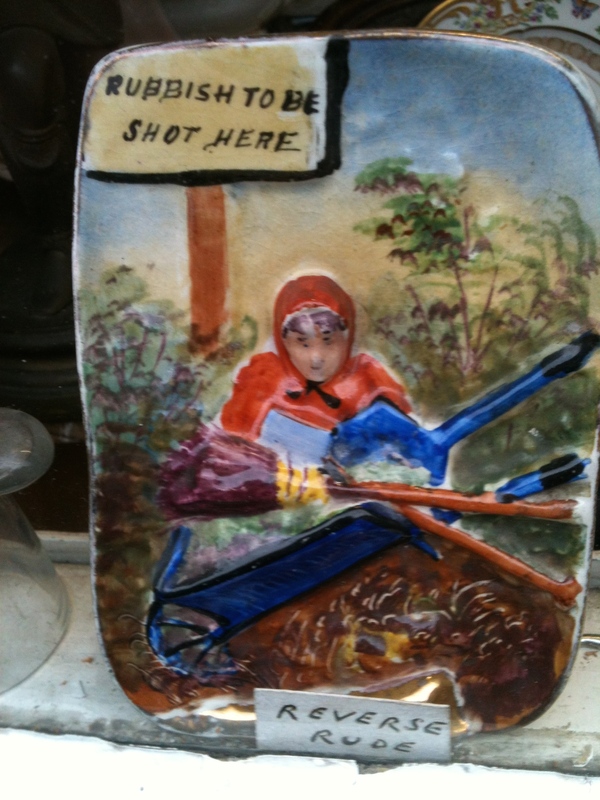 So it seems I’m far from being alone in my penchant for a ‘dainty rogue in porcelain’ – just as well – my mantelpieces are littered with the evidence of my weakness. 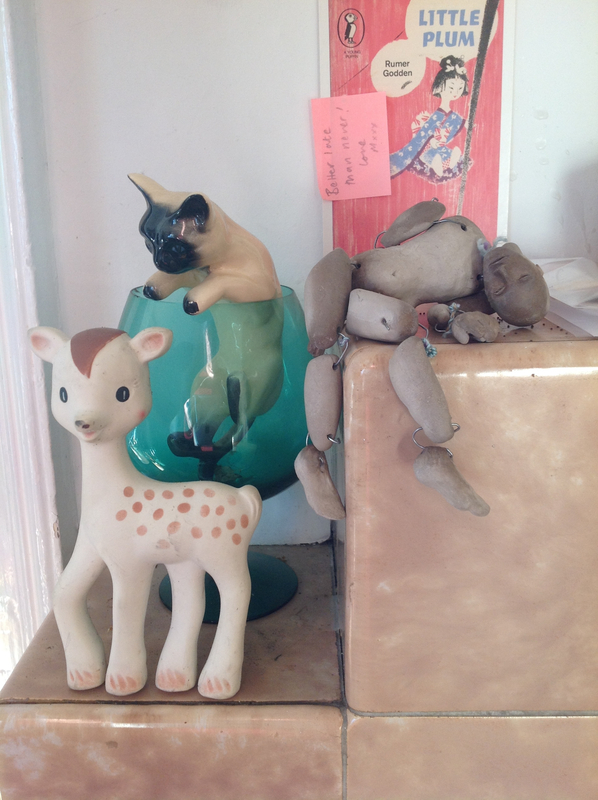 I have serially collected ceramic fish, teapots, frogs, birds and anything glazed in green. I came upon this enchanting piece in Perth. Perhaps it’s a good thing that the shop was closed because I know I would have had to buy it if only to find out that was so rude about the reverse side. 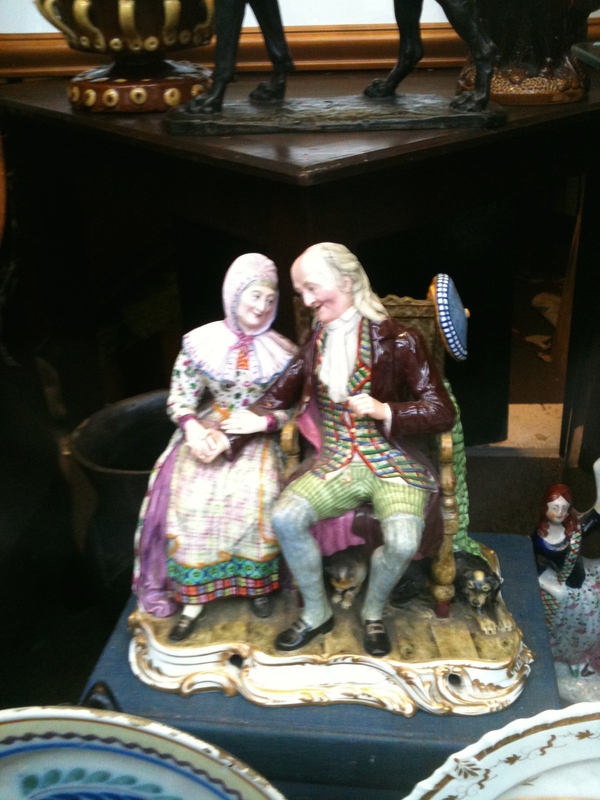 And in the same shop – a Scottish Darby and Joan! Apologies for the quality of the last two shots – taken on my phone in quite difficult weather conditions. I would like to know the story of these pieces; who they used to belong to and how they ended up in the shop. 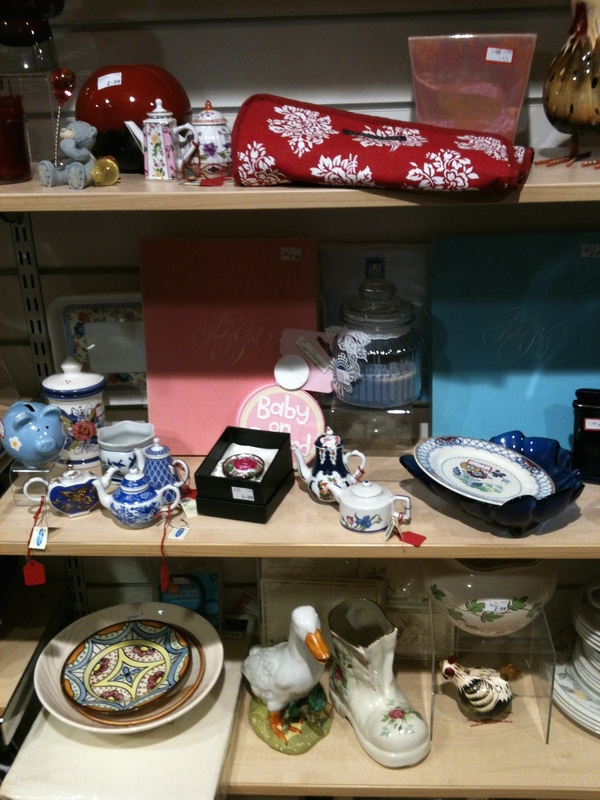 Similarly I always wonder about pottery in charity shops – why are there always so many china bells, miniature teapots and pottery boots? There is an infinite pathos about these left over knick knacks. Perhaps they were once cherished and lovingly dusted by their owners or perhaps they were unwanted gifts that were kept (and displayed) to avoid giving offence. I will never know their stories but I will continue my ruminations in the next post. *Twain, Mark, ‘A Tramp Abroad’. ** Houston, John, Richard Slee – Ceramics in Studio, Bellew Publishing 1990, p28.Richard Slee is an influential contemporary ceramist. His work has been exhibited at the Victoria and Albert Museum and at the Tate, St Ives. *** “And still she may be a dainty rogue in porcelain.” – from The Egoist, George Meredith’s tragi-comical novel. This entry was posted in Boboli Personality, ceramics, Pleionexia, Uncategorized and tagged a dainty rogue in porcelain, ceramics, Mark Twain, pleionexia, Richard Slee. Bookmark the permalink.